James Alexander Holden emigrated to South Australia from England in 1852 and in 1856 established J.A Holden & Co, a saddlery business in Adelaide. The firm evolved through various partnerships and in 1908, as Holden and Frost, moved into the business of minor repairs to car upholstery and manufacturing hoods and side curtains. In 1913 the firm began to produce complete motorcycle sidecar bodies. From 1917, wartime trade restrictions led to Holden & Frost commencing large scale production of car bodies. H.J Holden incorporated a new company in 1919, Holden's Motor Body Builders Ltd (HMBB). Holden's Motor Body Builders Ltd made bodies to suit a number of chassis imported from different manufacturers, but particularly Chevrolet. In 1931 General Motors purchased the business and formed General Motors–Holden's Ltd. 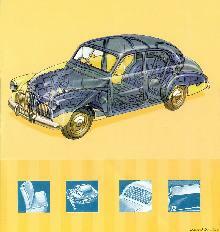 In 1998, it was renamed Holden Ltd and in May 2005, it became known as GM Holden Ltd. Launch of the first Holden in November 1948 by Prime minister Ben ChifleyAfter the end of World War II, the Australian government took steps to encourage an Australian automotive industry, and persuaded General Motors to build "Australia's own car". 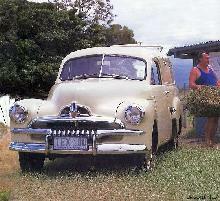 The Holden 48/215 (also unofficially called the FX), introduced in 1948, was a medium-sized vehicle fitted with a 132 in³ (2.15 L) engine, and based on a design proposed for the 1949 Chevrolet, that had been rejected as being too small for that purpose. Although not particularly mechanically or stylistically sophisticated, it was simple, rugged, more powerful than most competitors, and offered reasonable performance and fuel economy in an affordable package. Better suited to Australian conditions than its competitors, and assisted by tariff barriers, it rapidly became Australia's best-selling car. The millionth Holden (an EJ) comes off the line at Fishermen's Bend.Despite the arrival of competitors in the 1960s, Holden's locally-produced large six and eight-cylinder cars have remained Australia's top-selling vehicle for most of that time. 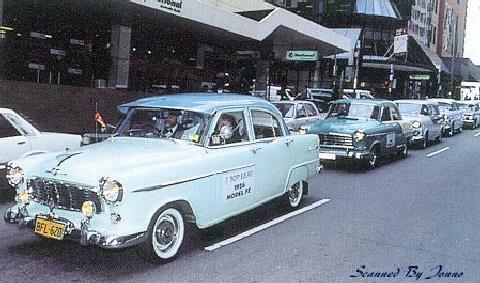 The Kingswood sedan, wagon and ute (utility or pickup truck) was exported and assembled abroad, including New Zealand along with South Africa (badged as the Chevrolet Kommando), Indonesia and Trinidad and Tobago. Holden has offered a reasonably full range of other vehicles, some locally produced but others sourced from various other parts of the General Motors empire, such as Chevrolet, Opel, Isuzu and Suzuki. Another notable Holden offering was the mid-size Torana, introduced in the mid-1960s, and initially based on the British Vauxhall Viva. The name 'Torana' was an Aboriginal word meaning 'to fly'. The Torana LH/LX series, which consisted of 3 door hatchback and 4 door booted sedan variants (between 1974 and 1978) was unusual in that it was offered with a choice of four (1.9 L OHC), six (2.8 L, 3.3 L OHV) or eight cylinder (4.2 L, 5.0 L OHV) engines. The four, later renamed Sunbird, was very sluggish, the eight-cylinder version alarmingly fast: the six was the most popular option. The Torana was replaced by the 1982 Camira, which was GM's medium-sized "J-Car". 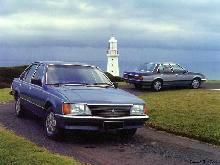 Bodywork for the Camira wagon was exported to the UK for Vauxhall's Cavalier. Between the late 1980s and mid-1990s, the Australian government introduced a plan to restructure the local motor industry, which involved local manufacturers sharing models, known as the Button Plan, after the federal minister for trade and industry, John Button. Holden sold the Nissan Pulsar as a Holden Astra (not to be confused with the Opel-sourced model of the same name) and used the 3.0L turbocharged 6 cylinder engine from Nissan's Nissan Skyline in the VL Commodore (1986-1988)(which was specifically designed by Nissan for Holden). In 1988, it then entered a partnership with Toyota in Australia, to form a joint venture company called United Australian Automobile Industries (UAAI). In 1989, Holden began selling rebadged versions of Toyota's Corolla and Camry, as the Nova and Apollo, while Toyota sold the Commodore as the Toyota Lexcen, named after the late America's Cup yacht designer, Ben Lexcen. This badge engineering proved unpopular with buyers, even though rival Ford had been somewhat successful with its Laser and Telstar models, which were just thinly disguised versions of Mazda of Japan's (The Japanese branch owned by Toyo Kogyo and Ford, while Mazda of America is under Ford) 323 and 626. In 1995, UAAI was dissolved, and Holden was able to source product offerings from GM rather than from other manufacturers in Australia. Between 1996 and 1997, Holden replaced the Toyota-based Nova and Apollo with the Astra and Vectra, imported from Opel in Europe. The Opel Corsa was sold in Australia as the Holden Barina, replacing another model of that name, originally introduced in 1986, based on the Suzuki Swift. The Vectra was briefly assembled locally for export to neighbouring countries, but this was dealt a severe blow by the Asian economic crisis in 1997. It has subsequently been imported from Europe. Although its Opel-sourced models have been relatively successful, Holden has now looked to the GM owned Daewoo in South Korea for replacements. Holden has already established close research and design links with Daewoo, with which it provides the large Statesman model. The 2006 model Holden Barina is based on the Daewoo Kalos, and the entry-level Astra Classic was replaced by the Holden Viva, based on the Daewoo Lacetti. However, the Astra badge is continued with the CD model Astra. Due to tariffs and exchange rates, various Vectra models are more expensive than the larger Commodore in Australia and New Zealand, and the European model is likely to be replaced by a version of the new Daewoo Tosca in 2006. In August 2006, Holden released the all new VE Commodore receiving increased power upgrades, performance, handling and appearance. For October, Holden has announced the intention to sell the Hummer H3 in Australia.